**UPDATE: A new, and even better (in our opinion) sangrita recipe has been discovered. We even made a video of us following the recipe! We’ve already mentioned sangrita in previous posts, but in this one I’d like to share one sangrita recipe that tastes pretty good. – It’s difficult to find sangrita in a bar. – Most places that say they have it think you are saying “sangria,” and they don’t really have it. – If a tequila bar doesn’t have sangrita behind the bar, then it’s not a *real* tequila bar. – It is rarely on the menu – you just have to ask for it. – When a white boy like me asks for it, I sometimes get a smile and a nod from the bartender, and I feel like a member of an exclusive authentic tequila drinker club who just uttered the secret password that lets him know that I’m not to be messed with. – It comes in various recipes, and since it is almost always made right there in the bar, you never know what you’re going to get. – Some of the best sangrita we’ve ever tasted was at the San Angel Inn, an amazing restaurant in Mexico City. – Some of the worst sangrita we’ve ever had was served to us in a bar in Tlaquepaque, believe it or not. It came from a bottle made in some mass-produced factory and it looked like sugar water with red food coloring, and it tasted like it. We could tell it was not to be touched just by looking at it. I, of course, tried it anyway, and it was truly nasty. – Bartenders take pride in their sangrita mixes, and every one seems to think they’ve got the best. Of course this is not true, but when you are sitting in front of a proud bartender who is watching you drink it, you should say something nice about it even if it tastes bad. Get him/her mad and he/she may cut you off. – We always ask for it, but seldom get it. – Places in San Francisco that have sangrita: Tres Agaves, Tommy’s Mexican Restaurant, Cava 22, Tropisueño, and Colibri. Of all of these, we felt that Amado, the bartender at Cava 22, makes the best. He gave us his recipe, and we went right home and whipped up a batch. We made 32 ounces of sangrita using Amado’s recipe as a guide. Mix all of those ingredients together, then put it in the refrigerator for 2 days. Yes, two days! Remember, there is no one perfect recipe. As we continue our worldwide tequila tasting tour we will continue to request sangrita, and when we find a good batch we will try to wrestle the recipe out of the bartender. If we succeed, we’ll share it with you. Glad you posted this 7 years ago – I’m headed to Toronto next week, glad you’re still in business, we’ll check it out! This looks like a good recipe! When I was in Cancun earlier this year the Bartender at the Ritz Carlton used almost that exact recipe except he included 2 tablespoons of lemon juice and about 15 shakes of Worcestershire Sauce. I had never heard of sangrita before and absolutely love it as a way to drink my Reposados! It occurs to me that this would also make a great marinade for pork or chicken! 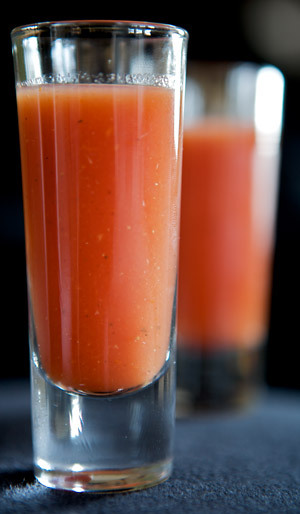 I use a ratio of equal parts tomato juice, orange and lime juice then add grenadine and hot sauce of choice to taste- of coarse this is the basic recipe and all or more flavors can be added or adjusted according to taste, adding horseradish, lemon zest etc etc etc. Sangrita refreshes the palate and embelishes Tequila and Mezcal. I also use Grenadine in my Sangrita recipe. I’ve searched the network for 2 days to see if anyone else uses it. You are the only one I have found. I got the recipe from a bartender at one of the resorts of the Cancun-based Real Resorts system 15 years ago. 1/2 grapefruit, 2 or 3 blood oranges, 2 limes. Extract the juice by hand or I use a Black and Decker citrus juicer I bought for $20 at Target. I generally run this through a small sieve as there are seed bits in the grapefruitand the larger bits of pulp. This should yield about 10-12 oz. of juice. I then add 12 oz. of tomato juice, then season with salt and black pepper to taste usually 1/4 tsp of salt and 1/2 tsp of fresh ground black pepper. From here I often add 1/2 tsp of tabasco for that extra kick or for a smoky, spicy flavor reconstitute several dried poblano pepprs and mince them up and add. Adding the poblano means I usually strain the liquid one more time to remove the larger poblano chunks after the concoction has steeped for a while. Refrigerate for several hours or overnight, shake and enjoy. Love your website! Love my new found interest in Tequila! My wine collection is getting ignored. The Sangrita recipe is fantastic. I modified slightly, doing 2 parts Tomato Juice to 1 part Clamato, and adding a few shakes of Worchestershire sauce. Question: Would you only drink Sangrita along side Tequila or would you mix it together, some kind of Bloody Mary kind of drink? We’d drink them separately (sip tequila, then sip sangrita), but if you do mix let us know how it goes! When you mix it’s called a Vapiros or Vampiros Mexicanos. There are sites that state you can drink this like a bloody mary. About 4 or 5 to 1 on the sangrita to tequila. One of my favorite sangritas was at the Hotel Nikko in Mexico City, and an Argentinian restaurant across the street (that’s also where I first tried Clase Azul). Hooked on all of it now. There is a great drink called a “Vampiro” using sangrita. Use 2 oz. of your fav tequila, fill the glass 3/4 way up with squirt or fresca, top with sangrita and squeeze in fresh lime. Yummmmm! I have a good story that brought me to your site. I used to drink margaritas but I am living in the Philippines and they are never very good here so I started drinking straight tequila and sipping it. I didn’t realize that I was being authentic. The real funny thing is that there is a great Mexican Restaurant here in Cebu called Maya and I ordered a shot and they served it with a tomato juice substance that was so good. I realize now that is was Sangrita. I will go see if I can get a recipe out of them. John, the bartender at Armando’s on Pacific Beach, introduced me to the wonderful pairing of tequila and sangrita. It is delicious! If you’re in San Diego – check it out! Intriguing. What role does the sugar play? Is it simply to sweeten the drink, or is there some Walter White going on as well? CHeers! In Jalisco, tomato juice is not in traditional sangrita. Rather, traditional sangrita generally contains some combination of orange (often blood orange) juice, lime juice, chili pepper, and pomegranate-based grenadine. Neither too sweet or too spicy. Red color comes from peppers and pomegranate. Sangrita is sipped, alternating with tequila blanco or repesado, also sipped. “La Bandera de Mexico” is one way to serve sangrita and consists of fresh lime juice, tequila blanco and sangrita, sipping in that order — the colors of the Mexican flag (green, white red). Enjoy!! ( Vida De Sanchez ). I come from a Hispanic background and as long as I can remember iv always seen bars and social events with families and cousins as-well as trips across Mexico drinking there favorite tequilas with this. Can you guys post a review based on your’ thoughts on Vida De Sanchez compared to the some of the sangritas ya’ll have created or seen across the journeys. We’ve also seen it, and to be honest, we much prefer the “Sangrita de la Casa” style of hand made sangrita. If we request sangrita and they bring us that instead, we probably won’t drink it. I always thought in Mexico they called it Sangita and not Sangrita? Which? Ron it’s definitely SANGRITA or (little blood). Sangita is not a word in Spanish as far as I know.